Breakdown: Clovis will mark the return of Redwoods (CA) senior Liam Anderson, who was third at Nike Cross Nationals last year and a second-place finish in this race in 2017. Here we should get our first glimpse of whether he should immediately be positioned back into the mix as the top runner in the country. But a win won't come easy. He'll face Jesuit (CA) junior and MS50 No. 20 Matt Strangio, a CIF champion this past spring at the 3200m who finished fifth in this race last year. Strangio, as reported on California MileSplit, has been battling injury in recent weeks but will look to take this race out. Newbury Park (CA) junior Nico Young, who owns the top 3-mile time in the country and is No. 18 on the MS50, will also be in the field and should bring some heat. Meanwhile, in the boys field, teams will try to give Great Oak (CA) a run for its money, which on its face could be a tough bargain. Sometimes these kinds of competitions can become "trap meets," because they can catch teams at a precarious position. In Great Oak's case, it's won at such an easy clip so far that it wouldn't be easy to overvalue the performances it's had thus far. As a result, the Wolfpack shouldn't overlook anyone. In the girls elite race, it will be loaded with talent. No. 8 Great Oak will face the kind of competition it will likely see at CIF in Buchanan, Palos Verdes and Mission Viejo. It could be anyone's race to win. 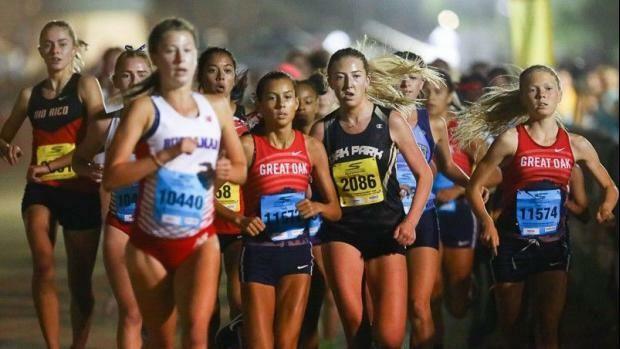 Up top, Great Oak's Tori Gaitan and Arianna Griffith have raced staggeringly smart over the course so far, choosing to work the lead pack in the initial moments before settling on a decisive close in the final moments. Both will get their biggest test yet, with Buchanan's Corie Smith and Meagen Lowe, as well as Ayala's Mikaela Ramirez and Oak Park's Sylvia Cruz-Albrecht and Sarah Shulze, all featured in the elite race.